On Friday, Hennepin County will hold one of its periodic yard sales of properties seized by the government after owners defaulted on property taxes. For a minimum bid of as little as $10,000, you could pick up houses in Minneapolis, Robbinsdale, Maple Grove and other towns, as well as the unique opportunity to own a cell tower in Golden Valley. My eye was drawn to the "historic church," (above) more properly the former First Church of Christ Scientist, at 614 E. 15th St., in Minneapolis' Elliot Park neighborhood. Its significance as the state's first Christian Scientist church and its elegant columns and portico earned it a place on the National Register of Historic Places in 1986. 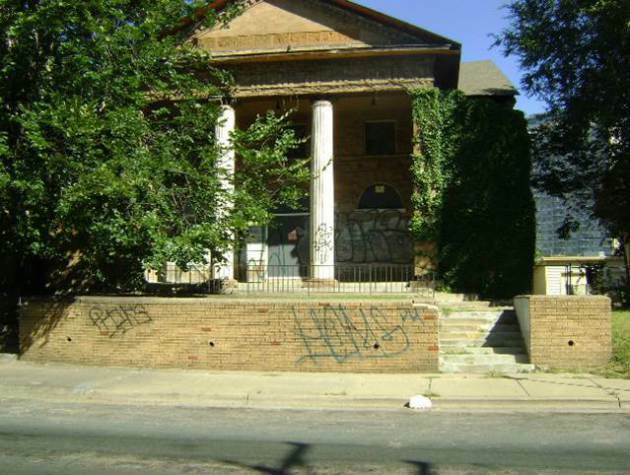 Since 2005, it has sat on another list, too: the city's registry of problem properties. That's an issue I'll be looking into further. I remembered the place from two years ago, when activists with the Occupy movement broke into the old church and squatted there for 45 minutes before the police hustled them out. At the time, the city held out hope that someone with a little more money would show up to restore it. In the YouTube video (below), a protest organizer blames Hennepin County for allowing the property to rot. "Today, this building is all of ours." If Occupy can scrape together $37,500 (opening bid), then they can have it for good. The same year as the occupation of the old church, the number of properties seized for tax debts in Hennepin County reached a 20-year high. Here's the full list of properties to be auctioned Friday. More details on the auction are here.